The new £10m Bus Station in Swansea, owned and operated by City & County of Swansea, has been fitted with a combination of Dor-O-Matic Single Slide and Compact Slide automatic doors to help keep passengers warm, safe and secure. Supplied by Ingersoll Rand Security Technologies and installed into curtain wall screens supplied by Dudley’s Architectural Aluminium, they are used throughout the terminal on the pedestrian entrances and at the access points to the bus and coach bays. 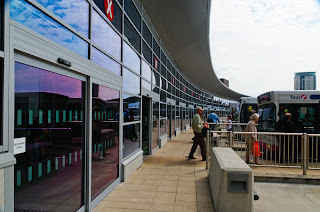 The Single Slide automatic doors, which lead to the 23 bus bays, have been cleverly configured using induction loops so that they will only open when a bus is at the stand and a passenger is waiting. This prevents passengers walking out into the vehicle yard and the associated health and safety risks. Importantly, this innovative system also helps to maintain the temperature inside, helping to prevent the escape of heat in winter and cool air in the summer. Another benefit is that it reduces the ingress of wind, rain, fumes and dust which helps to maintain appearances, reduce maintenance costs and improve the environment for users. The Compact operators are used on the pedestrian entrances to the station and other internal doors. The operator is a self-contained electro-mechanical drive unit ideal to be mounted on the surface of both new and existing sliding doors. Manufactured in high-grade extruded aluminium, it combines simple functionality with subtle elegance and robust construction. The low-profile design is suitable for use with most commercial architectural systems and, with an overall height of only 10.5cm and projection of just 13cm, adds a contemporary look to any doorway. Both automatic doors feature a number of built-in safety features, which include an auto-reverse function which detects obstructions and prevents the doors from closing until the obstruction is removed; and a fail-safe function, which will ensure the doors are powered to either the open or closed position (choice pre-programmable) should a power failure occur. The operator is manufactured in high-grade extruded aluminium with a low-profile design. With an overall height of just 115mm and depth of 123mm, it complements aesthetically most existing profiles and can be adapted on site to suit a variety of door and frame widths. Because the components are mounted on a first-fix backplate, lateral adjustment of the drive mechanisms can achieve perfect alignment of the operator with the opening. The operator features numerous control functions including: manual operation, adjustable opening/closing speed, delayed action and push/go (where the opening cycle is initiated by gently pushing or pulling the door). Two versions are available using either a slide track mounted on the door for fixing on the 'Pull' side or with projecting arms for fixing to the 'Push' side. The Single Slide is one of a number of dedicated automatic openings solutions from Ingersoll Rand Security Technologies which includes sliding doors, telescopic doors, folding doors, balance doors and swing doors. Each solution has been designed to meet a specific problem and is backed up by a full technical advisory service, in-house design and project management team. Ingersoll Rand Security Technologies is a leading global provider of products and services that make environments safe, secure and productive. The sector’s market-leading products include electronic and biometric access control systems; time and attendance and personnel scheduling systems; mechanical locks and portable security; door controls, exit devices and architectural hardware; performance steel doorsets and automated openings; and other technologies and services for global security markets. Ingersoll Rand offer a full design, installation and commissioning service backed by a national network of installation and service engineers, all trained to BS7036 standards.